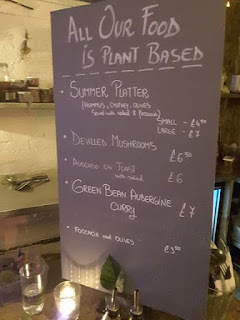 Support Manchester's Hidden Vegan Secrets on Patreon! 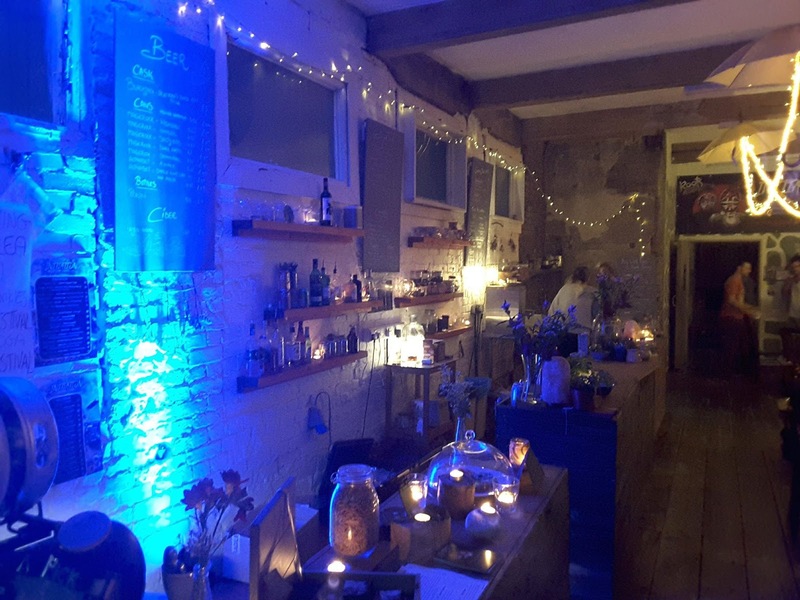 Manchester's Hidden Vegan Secrets was launched in August 2017 and currently has a readership of over 2,000 per week. I have had a lot of people get in touch to thank me for introducing them to new vegan eateries and for making it easier for them to find decent vegan food. I really do appreciate all the support and encouragement I have so far received. It makes me believe this is a useful tool for pushing veganism in Manchester, one of the UK's most vegan friendly cities. I am now launching a Patreon to help push the website to achieve more and to reach far more people. What is Patreon and why am I using it? Patreon is a platform where content creators of all kinds can raise funds to support the work they do and allow them to focus on their work rather than other income to subsidise their content. Supporters can support their favourite content creators with monthly donations. Content creators can in return offer rewards as a massive thank you to their Patrons. 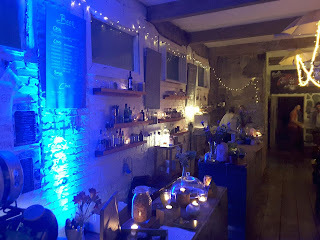 I am asking for support to help make Manchester's Hidden Vegan Secrets the best it can be. There are costs associated with running the website and so far I have invested some of my own money to cover these costs. It costs to host the website. I am in the process of hiring a graphic designer to make simple improvements to the site. It does cost to visit and eat at the restaurants, cafes, takeaways and shops to review for the site. It takes a few hours to write the review and edit photos for every post. I do this all on top of working 44 hours a week in my day job. In the future I would love to expand what the website can achieve. I want to hire a graphic designer to do a full re-design of the website to make it better and more accessible. I want to create simple merchandise such as stickers and badges, some of which would be given away for free to help promote the website. A long term goal would also to write and publish a book or zine, being the ultimate guide to vegan friendly places in Manchester. I would not be able to achieve all of this without your support. What rewards do Patrons receive? As a massive massive thank you for supporting the website, Patrons will receive a number of rewards. All Patrons will get to vote on upcoming reviews, choosing where I review next. For each post I take a lot of photos and only a small amount of them make it onto the post so Patrons will get access to the extra photos and other behind the scenes material. I will do monthly question and answer sessions with my Patrons. Once merchandise becomes available, Patrons contributing above a certain amount will receive some free merchandise. And if any supporter wants to suggest other perks they would like to see here I am open to suggestions. What if I am unable to support you on Patreon? If you are unable to support the website here on Patreon, do not worry. The website and it's content will always be available for free for everyone. I massively appreciate every single time someone shares posts on social media or follows one of our social media accounts. Those things really help the website to grow. The Wonder Inn is closing one week today. I should have written a review of this place weeks ago and feel bad that I don't. You all have one week to visit The Wonder Inn before it closes. 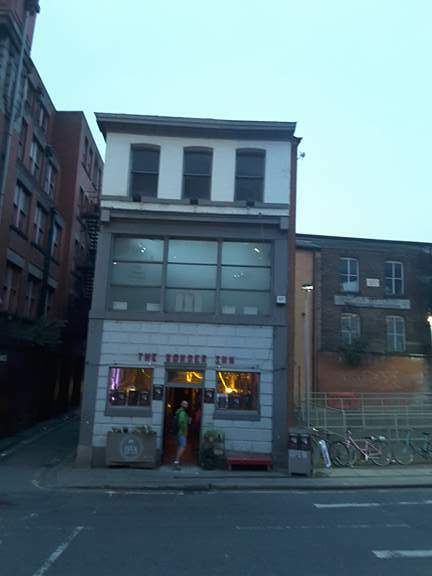 It's location is about a 5 minute walk from Victoria train station and a 1 or 2 minute walk from Shudehill tram stop and bus station. The Wonder Inn opened up 3 years, and is a large vegan pub and venue. As you walk in the front entrance you see a reasonable sized cafe and bar. When I first went here this is all I thought there was, enough seating for perhaps 30 people. However, there is so much more to the Wonder Inn. At the back of the building there is another room with a lot more seating and the toilets. There are other rooms in the back where they hold events. Upstairs there are a number of large rooms where they hold large events. These events include music concerts, poetry nights, talks, workshops, yoga, martial arts and a lot more. The Wonder Inn is fully vegan and has a lot of raw options. 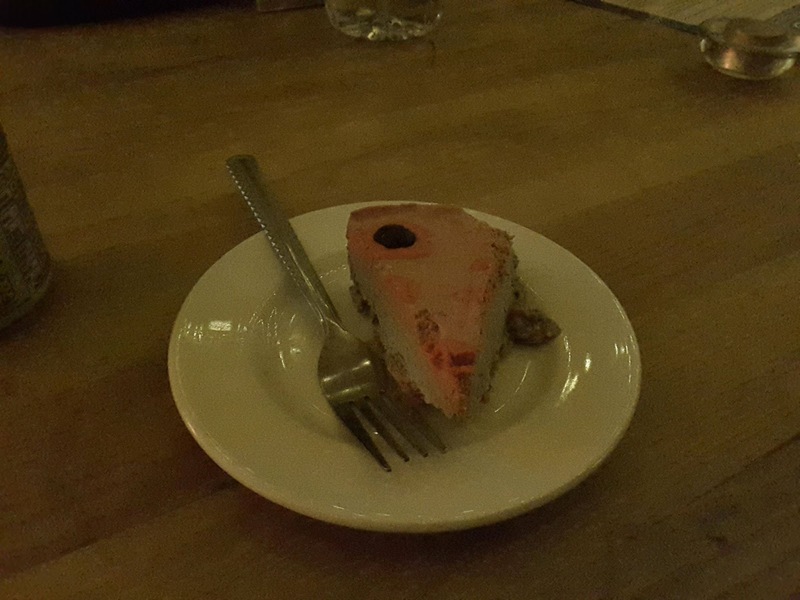 Their raw cakes are brilliant. Their hot food is really wholesome and very healthy. 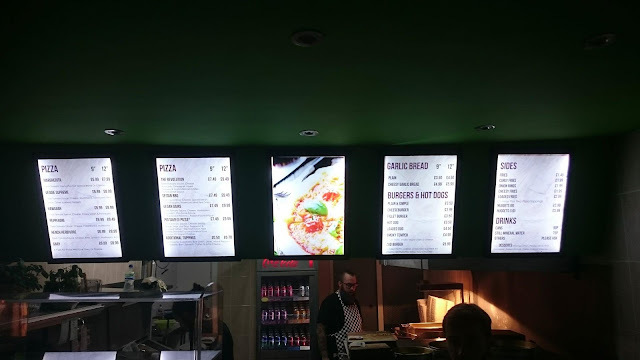 I have only tried their cakes, but I have heard that the hot food is good. However, the portions are small for the price, and the cakes aren't cheap either. Neither are the drinks here. Everything is of a very high standard though. What really makes The Wonder Inn for me though is the ambiance. 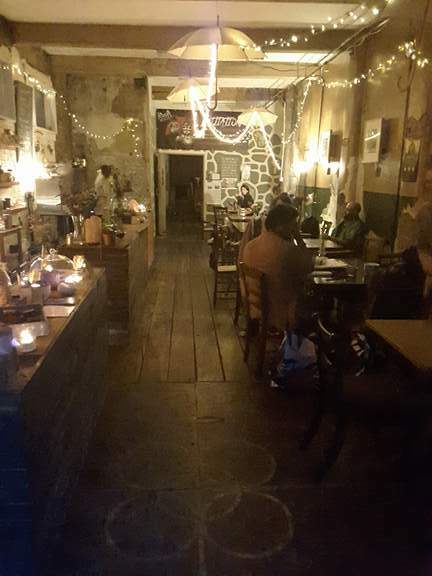 It feels like a pub and a cafe combined. It's somewhere I can feel comfortable hanging out all day long. There's plenty of space and you can spend hours there just having a few cups of tea if you wish. I have spent time here hanging out with friends casually for hours on end. You wouldn't be out of place drinking tea and reading a book on your own for hours either. There aren't many places in Manchester that I feel that way about. At least not without spending lots of money or drinking a lot. It feels like a safe space for hippies everywhere. Unfortunately the costs of running such a large venue have paid their price. The Wonder Inn can no longer keep up with the cost of rent and bills. They are closing on 31st October and are having a closing party this Sunday where the owner is performing a music set as she is a musician. It is a ticketed event but hopefully the cafe/bar will still be open for free for all. It's certainly somewhere worth visiting before it closes down. Wait for food: 10-20 minutes when quiet. When really busy up to 40 minutes. Phoning up in advance will save time when collecting. Delivery roughly one hour. I wouldn't exactly class Zad's as a hidden secret, however this website isn't strictly about finding the most unknown places. I just want to share the best vegan places in Manchester, and that's what Zad's is. 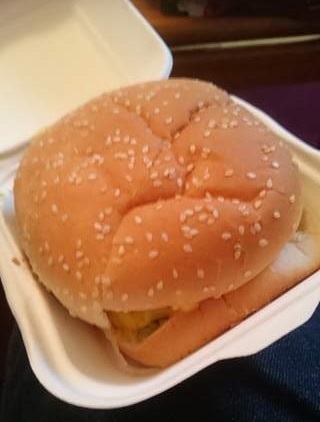 In my opinion Zad's is the best vegan junk fast food takeaway I have tried, at least in the North of England. Certainly the best in Manchester. 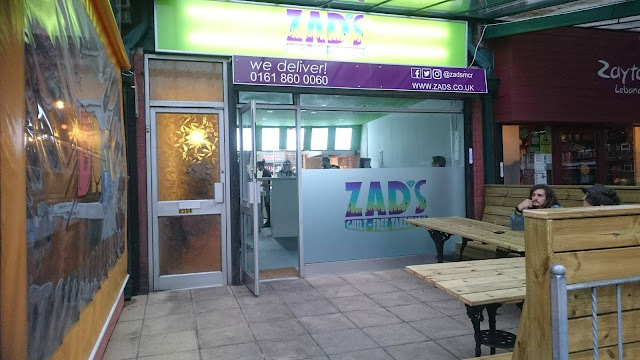 Zad's opened up earlier in 2017 on Barlow Moor Road in Chorlton. It was set up by vegans with lots of experience working in vegan and non-vegan kitchens. They only employ vegans as well. In my view, this is why Zad's is so great. Junk food vegan chiefs running a vegan junk food takeaway. They know what vegans want and what vegans are missing in Manchester. And they know how to run a kitchen well. On to the food. Zad's has a large range of vegan pizzas, as well as an option to create your own by choosing your own toppings. 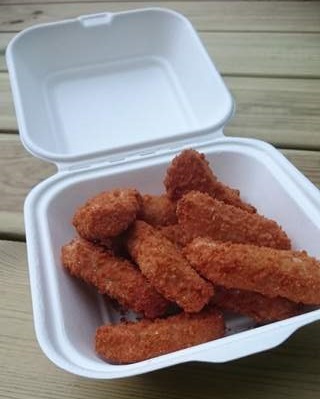 This includes a range of vegan meat alternatives including pepperoni, hot dog and smoked seitan. 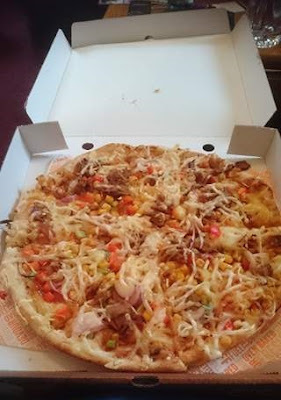 They have a Pig Save Pizza where for every sale 50p will be donated to one of the many Animal Save groups. 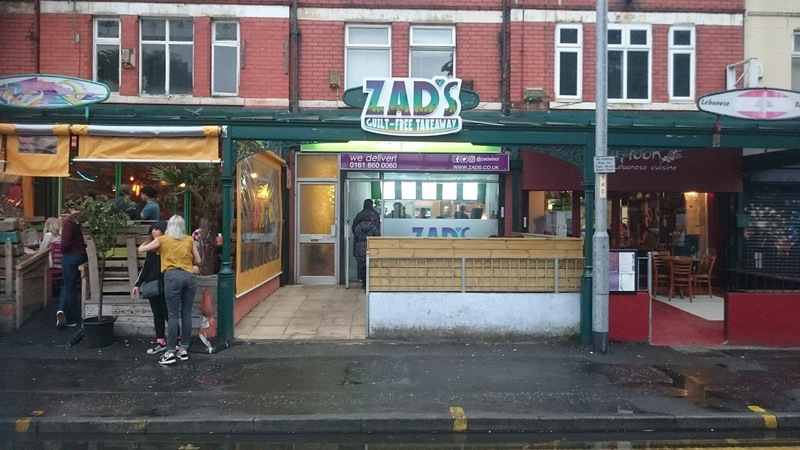 Zad's also offer a wide range of vegan burgers. Their signature burger, known as the Zad Burger, contains double patty, cheese, avocado & either an onion or pineapple ring. It is heavenly for those who like their junk food. Sides include chips, cheesy chips, curly fries, vegan chicken nuggets, and loaded fries. They also have a range of vegan desserts, usually cupcakes or brownies. The desserts aren't on their menu because the desserts change regularly. 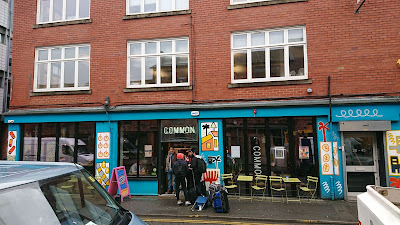 Since Zad's opened up in what many consider to be Manchester's most vegan populated neighbourhood, it has become very popular. Visit it at 7pm on a Saturday night and there will be queues of people waiting for foods. Originally Zad's intended to offer delivery, but when they opened up they didn't do delivery. This was because they wanted learn how to cope with the already large number of customers they gathered when they opened before expanding to delivery. They have since started offering delivery, but this again is limited and only done if you phone up and pay by cash when the food arrives at your home. Eventually they plan to launch the ability to order online and pay by card on their website for delivery. They are always advertising for more people with cars to become deliverers for them if anyone is interested. 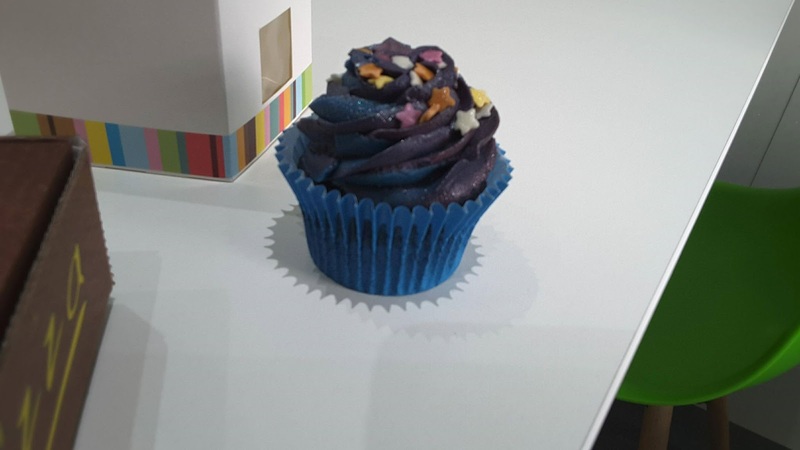 They currently only deliver within 3 miles of their Chorlton base.